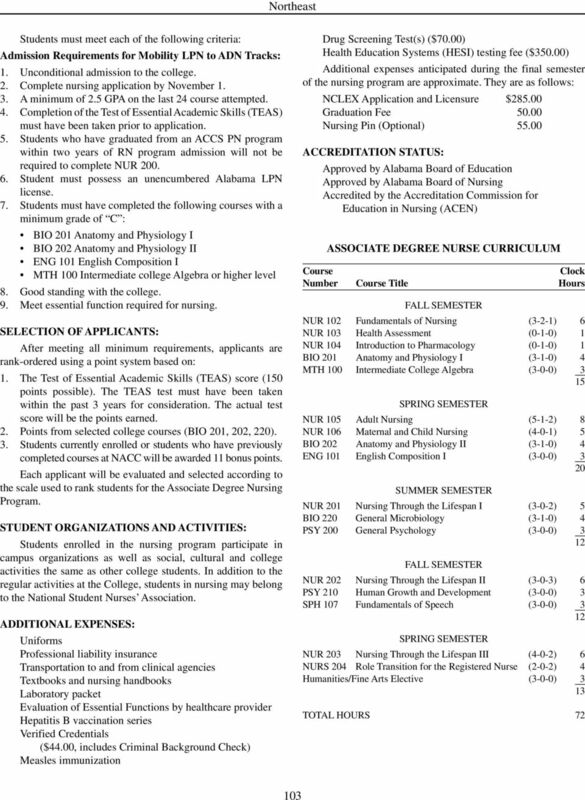 Download "HEALTH SCIENCE DIVISION PROGRAMS ASSOCIATE DEGREE NURSING"
3 7. Student must secure professional liability insurance at the beginning of each academic year prior to placement in a clinical agency. 8. 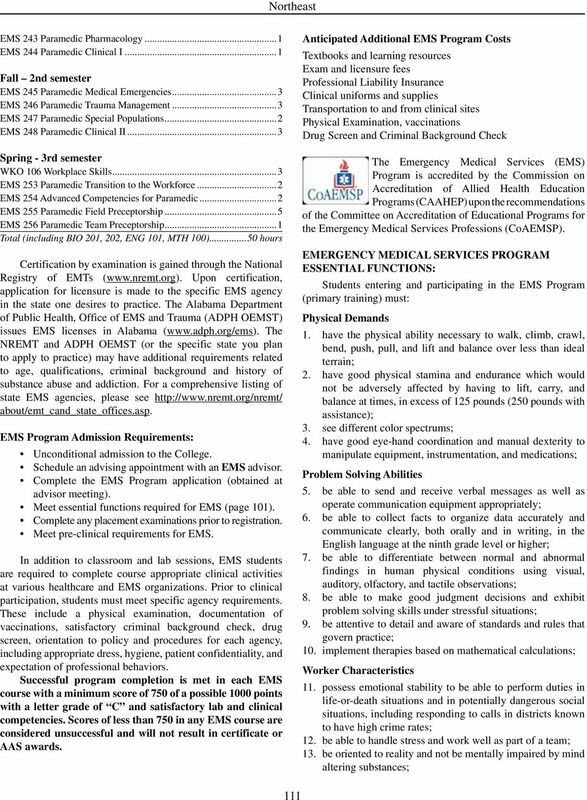 Student must show documentation of current cardiopulmonary resuscitation (CPR) certification at the healthcare provider level prior to placement in a clinical agency. 9. Student is required to obtain a health evaluation by a qualified health practitioner on the form provided by the nursing department. (Must be uploaded to Verified Credentials by deadline date.) 10. Student is required to obtain an evaluation of the Essential Functions as determined by a qualified health practitioner on forms provided by the nursing program. The evaluation must be submitted to Verified Credentials by deadline date. Additional health examinations may be required depending on physical or psychological alterations which may occur during the program of study. 11. With occupational exposure to blood and other body fluids, the student is at risk of acquiring Hepatitis B virus infection. Clinical agencies encourage students to receive a series of three Hepatitis B vaccines. The student must receive the first two vaccines prior to attending the first day of clinical. Students may refuse the vaccine series by signing a declination policy provided by the nursing department. It is the student s responsibility to obtain the vaccine from their personal healthcare provider. 12. As required by the clinical agencies, the student is required to submit to a pre-clinical drug screen. Additionally, random drug screens may be required should the student exhibit behaviors indicative of substance abuse during a clinical experience. Drug screening test(s) will be at the student s expense. A positive drug screen will prohibit the student from completing the clinical requirements of the nursing curriculum. 13. As required by the clinical agencies, the student is required to submit to a criminal background check prior to placement in a clinical facility. Students who have a positive background check will not be allowed to complete the clinical component of the nursing course and would need to withdraw from the nursing course. 14. Student must be registered prior to attending class. 15. Student must participate in the HESI Computerized testing. This is a testing program integrated throughout the curriculum aimed at increasing student retention and NCLEX-RN scores. The cost for all tests is approximately $ If the student scores below passing on any HESI exam, remediation will be required. Students who do not pass the Exit Exam on their first attempt will be required to retake the Exit Exam prior to graduation for an additional fee of $ COURSE : A course grade will be determined based on theory and clinical performance. Students must achieve a grade of 75% or above in each required nursing course to continue in the nursing program. A grade below 75% will result in a D or an F depending on the numerical score. 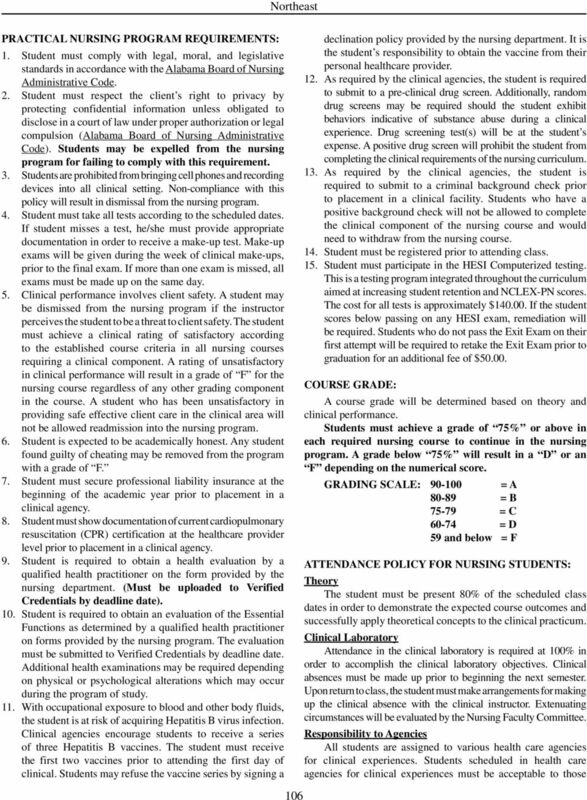 Northeast 102 GRADING SCALE: = A = B = C = D 59 and below = F ATTENDANCE POLICY FOR NURSING STUDENTS: Theory The student must be present 80% of the scheduled class dates in order to demonstrate the expected course outcomes and successfully apply theoretical concepts to the clinical practicum. Clinical Laboratory Attendance in the clinical laboratory is required at 100% in order to accomplish the clinical laboratory objectives. Clinical absences must be made up prior to beginning the next semester. Upon return to class, the student must make arrangements for making up the clinical absence with the clinical instructor. Extenuating circumstances will be evaluated by the Nursing Faculty Committee. Responsibility to Agencies All students are assigned to various health care agencies for clinical experiences. Students scheduled in health care agencies for clinical experiences must be acceptable to those agencies. The student is responsible for complying with policies and procedures required by the agency. Failure to meet this requirement may mean that the student is excluded from a required clinical experience and may be unable to complete the nursing program. ADVANCED PLACEMENT-LPN MOBILITY TO ADN TRACKS Licensed Practical Nurses (LPN) may receive advanced placement in the associate degree nursing program (see Mobility LPN to ADN curriculum tracks). 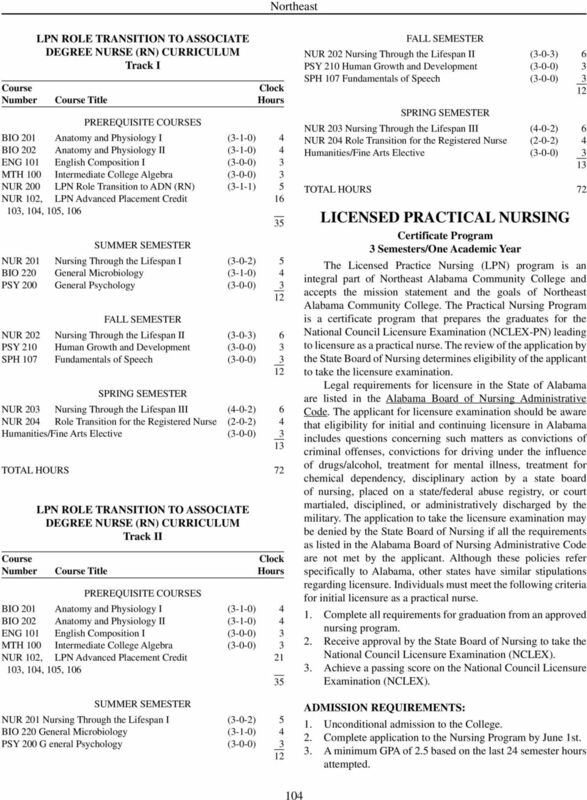 LPN s who have graduated from the Alabama Community College System Practical Nursing standardized curriculum may be eligible to enter the Mobility LPN to ADN Track II during the third semester without validation of theory and skills if graduation occurred within two years of admission to the mobility track. 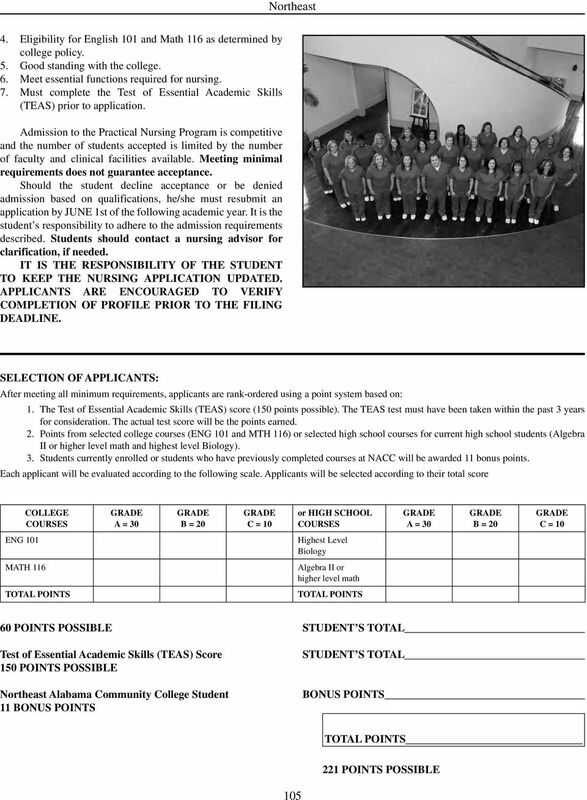 LPNs who have graduated more than two years prior to admission to the Mobility LPN track or those who graduated from a nursing program other than the Alabama Community College System Practical Nursing standardized curriculum will be required to successfully complete Nursing 200: Nursing Career Mobility Assessment for validation of theory and skills (Track I). Upon successful completion of Nursing 200, students are eligible for progression to NUR 201: Nursing Through the Lifespan I, the third semester of the ADN curriculum. 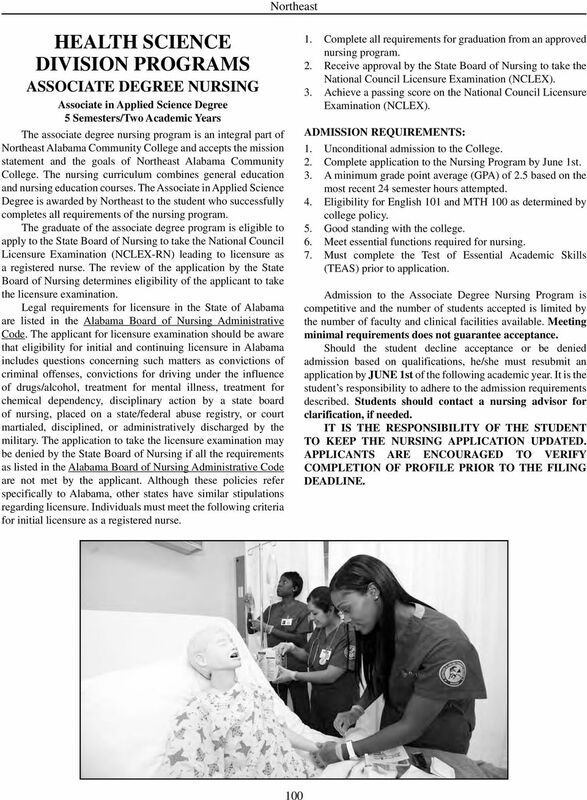 Admission into LPN to Associate Degree Nursing programs in the Alabama Community College System (ACCS) is based upon a numerical ranking system. Only course work from a regionally accredited institution will be used to satisfy program admission requirements. The positions for advanced placement are limited based on the number of nursing faculty and clinical positions available. Meeting minimal requirements does not guarantee acceptance. 8 agencies. The student is responsible for complying with policies and procedures required by the agency. 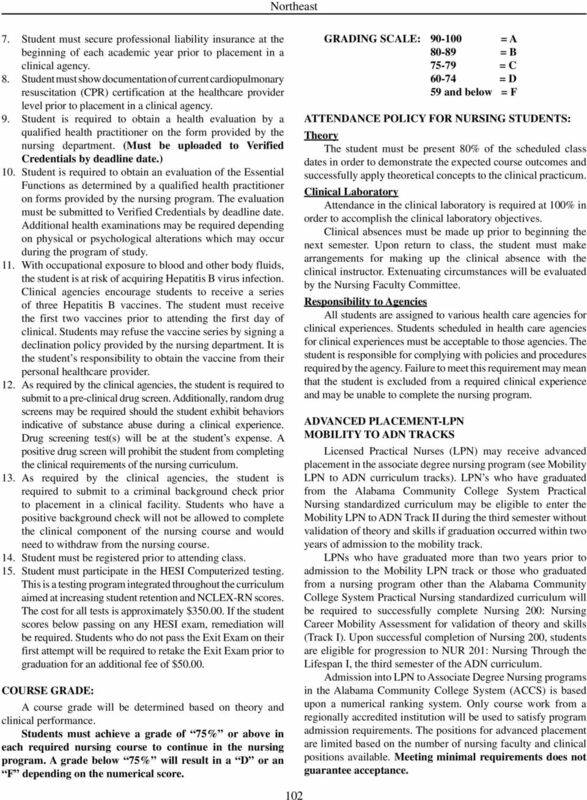 Failure to meet this requirement may mean that the student is excluded from a required clinical experience and may be unable to complete the nursing program. SUMMER SEMESTER NUR 107 Adult/Child Nursing (5-0-3) 8 NUR 108 Psychosocial Nursing (2-0-1) 3 NUR 109 Role Transition for the PN (2-1-0) 3 14 STUDENT ORGANIZATIONS AND ACTIVITIES: Students enrolled in the nursing program participate in campus organizations as well as social, cultural and college activities the same as other college students. In addition to the regular activities at the College, students in nursing may belong to the National Student Nurses Association. ADDITIONAL EXPENSES: Uniforms Professional liability insurance Transportation to and from clinical agencies Textbooks and nursing handbooks Laboratory packet Evaluation of Essential Functions by healthcare provider Hepatitis B vaccination series Measles immunization Verified Credentials ($44, Criminal Background Check included) Drug Screening Test(s) ($35) Health Education Systems (HESI) testing fee ($140.00) Additional expenses anticipated during the final semester of the nursing program are approximate. They are as follows: NCLEX Application and Licensure $ Nursing Pin (Optional) ACCREDITATION STATUS: Approved by Alabama Board of Education Approved by Alabama Board of Nursing Accredited by the Accreditation Commission for Education in Nursing (ACEN) PRACTICAL NURSE CURRICULUM Course Clock Number Course Title Hours FALL SEMESTER NUR 102 Fundamentals of Nursing (3-2-1) 6 NUR 103 Health Assessment (0-1-0) 1 NUR 104 Introduction to Pharmacology (0-1-0) 1 BIO 201 Anatomy and Physiology I (3-1-0) 4 MTH 116 Mathematical Applications (3-0-0) 3 15 SPRING SEMESTER NUR 105 Adult Nursing (5-1-2) 8 NUR 106 Maternal and Child Nursing (4-0-1) 5 BIO 202 Anatomy and Physiology II (3-1-0) 4 ENG 101 English Composition I (3-0-0) TOTAL HOURS 49 PROGRESSION POLICY FOR ALL NURSING PROGRAMS (ADN, PN, LPN MOBILITY TO ADN): In order to continue in the nursing program, the student must meet the following criteria: 1. Maintain a grade of C or better in all required general education and nursing courses. 2. 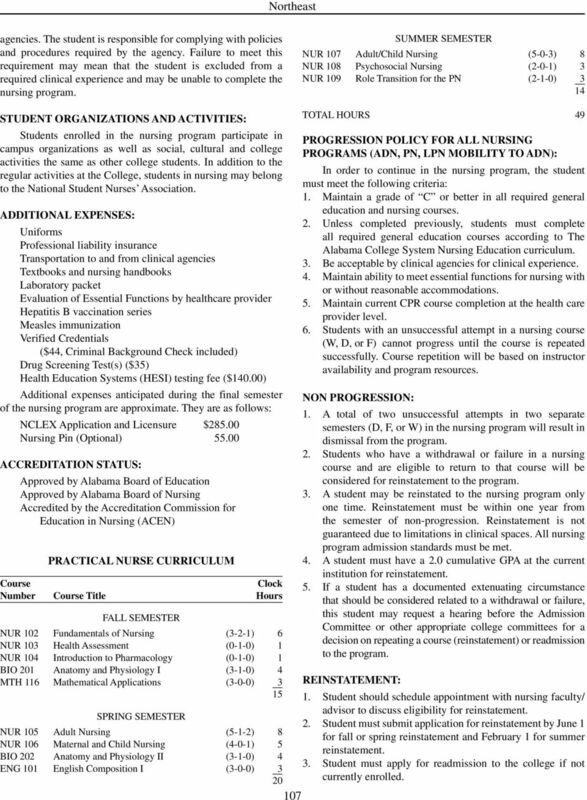 Unless completed previously, students must complete all required general education courses according to The Alabama College System Nursing Education curriculum. 3. Be acceptable by clinical agencies for clinical experience. 4. Maintain ability to meet essential functions for nursing with or without reasonable accommodations. 5. Maintain current CPR course completion at the health care provider level. 6. Students with an unsuccessful attempt in a nursing course (W, D, or F) cannot progress until the course is repeated successfully. Course repetition will be based on instructor availability and program resources. NON PROGRESSION: 1. A total of two unsuccessful attempts in two separate semesters (D, F, or W) in the nursing program will result in dismissal from the program. 2. Students who have a withdrawal or failure in a nursing course and are eligible to return to that course will be considered for reinstatement to the program. 3. A student may be reinstated to the nursing program only one time. Reinstatement must be within one year from the semester of non-progression. Reinstatement is not guaranteed due to limitations in clinical spaces. All nursing program admission standards must be met. 4. 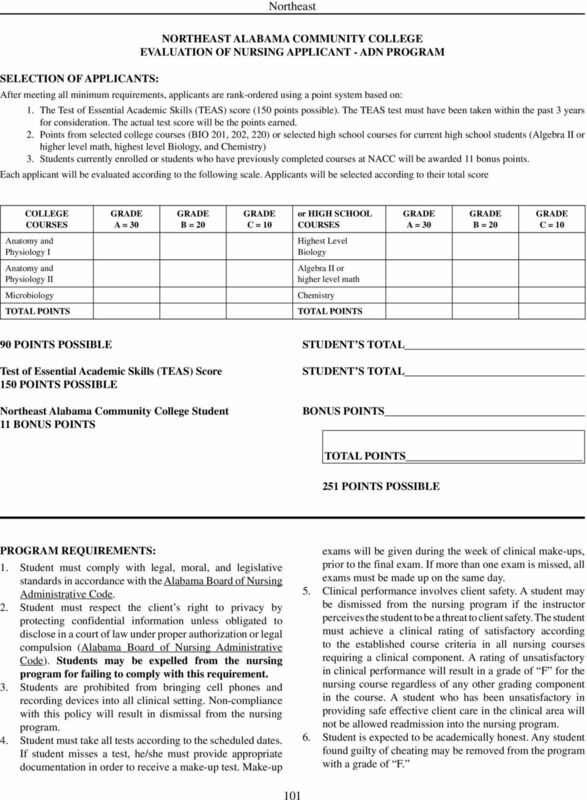 A student must have a 2.0 cumulative GPA at the current institution for reinstatement. 5. 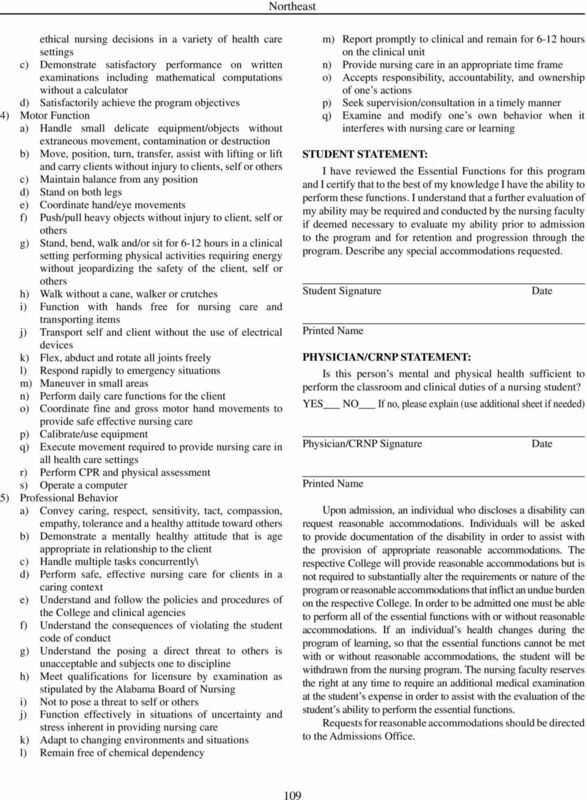 If a student has a documented extenuating circumstance that should be considered related to a withdrawal or failure, this student may request a hearing before the Admission Committee or other appropriate college committees for a decision on repeating a course (reinstatement) or readmission to the program. REINSTATEMENT: 1. Student should schedule appointment with nursing faculty/ advisor to discuss eligibility for reinstatement. 2. Student must submit application for reinstatement by June 1 for fall or spring reinstatement and February 1 for summer reinstatement. 3. 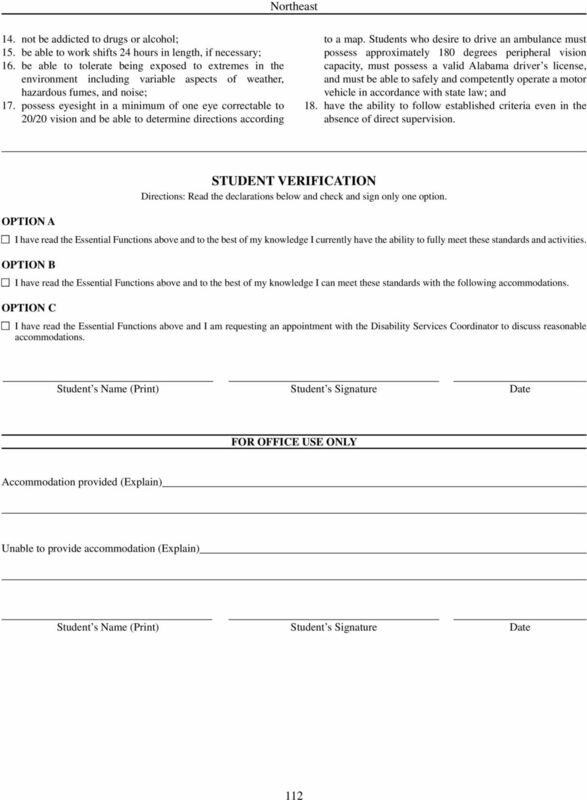 Student must apply for readmission to the college if not currently enrolled.